Color Plus Magna Doodle | OhGizmo! Walking through Toys ‘R Us these days it seems everything from die-cast cars to stuffed animals now incorporates electronics in some way as technology marches on. However it seems like the Magna Doodle from Ohio Art has chosen to take baby-steps into the 21st century instead. I guess if it’s not broken, just slightly upgrade it. 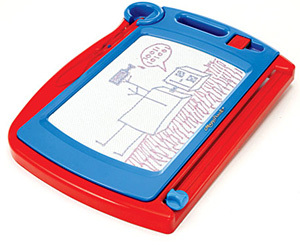 Where as the original Magna Doodle could only produce black and white imagery (well more of a dark grey on light grey to be honest) the Color Plus Magna Doodle is capable of drawing in either blue or red. The updated version uses two-toned micro magnets suspended in a gel in conjunction with a dual-tipped stylus. Each tip attracts a different color to the surface resulting in a mix of blue or red. The Color Plus Magna Doodle is currently available for about $15.